The SUPER STREET GAS 4×4 TRUCK is a class built for hot running trucks with under 540 cubic inches under the hood. Super Street 4×4 GAS Trucks began pulling with USA-EAST for the first time in 2013. The class has developed into one of the most competitive USA-EAST divisions with Chevrolet and Ford and Dodge all represented in this high-powered class. New rules developed a few years ago were designed to allow more trucks to compete with the SUPER STREET class in that season. The 454 Chevrolet and the 460 Ford engines along with the 440 Mopar are the dominators in this class that runs at 6300 pounds. Diesel trucks have been restricted from this class since 2007 and thus the class is strictly for gasoline 4x4s. Front end weights are permitted in this division but local trucks are still welcome. Mark Petros from Herminie in Westmoreland County, Pennsylvania was the point champion in 2018. 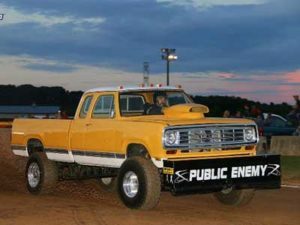 Petros, a five-time champion, drives “Public Enemy” a super running older model Dodge with a built up 440 cubic inch Mopar engine. This truck was the 2017 champion and now holds ‘back to back’ titles. Petros and his wife Jill are the owners of Greensburg Machine the company that supplies driveline and transmission parts to many of the pullers with USA-EAST. Local owners of the gasoline-powered pickup trucks are welcome to enter the SUPER STREET GASOLINE class when it comes to their town, but they will have to face some hard-charging trucks that will be following the entire season of events. All trucks that are “running for the points” must be members of the USA-EAST sanctioning body in order to collect series’ points. See www.USA- EAST.com for membership information. Cen.Pe.Co. Lubricants of Cleveland, Ohio and Wolcott, Iowa supplies their ‘bonus bucks’ to supplement the point fund for the Super Street Gas 4×4 division.